Pupils optimise the cost of building a village by-pass by making decisions based upon realistic data in the form of maps, tables and graphs. Pupils work in groups to plan and cost a village by-pass. The cost of building a bypass cannot be measured only in financial terms, so the Case Study challenges pupils to use mathematics to create an optimal route, using either software or physical resources, taking into account the wider social, environmental, work-related and economic issues. Pupils engage in problem-solving to decide which solution best takes into account these issues and the viewpoints of different stakeholders. The mathematical concepts include scale, speed and the measurement of curvature. Pupils need to balance environmental and social factors to determine a route and then cost their chosen route. They then design and present their plans and assess those of other groups. Specialised software is included, and extension activities create further opportunities for pupils to cost real by-passes, using Google Earth. 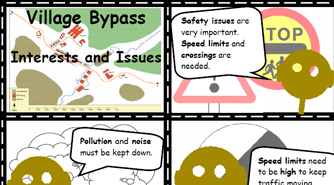 Use data tables and graphs from the Highways Agency. Find ways to satisfy constraints (minimum radii of curvature, verge clearance, cambers etc). Cost and present proposed solutions. Key processes - analysis of situations described in the activities, using mathematical procedures; interpret and evaluate, communicate and reflect on their results. Number and algebra - rational numbers, their properties and their different representations; rules of arithmetic applied to calculations and manipulations with rational numbers; applications of ratio and proportion. Geometry and measure - properties of 2D and 3D shapes; constructions, loci and bearings; similarity, including the use of scale; points, lines and shapes in 2D coordinate systems; units, compound measures and conversions. Curriculum opportunities - work on problems that arise in other subjects; group discussion and collaborative work - as well as work independently in a range of contexts; opportunities to use either ICT or practical work; work with other subject areas. This Case Study supports four to six hour-long lessons of classroom activity with optional homework and is suitable for all pupils in Years 8 or 9. There are opportunities for a mixture of class, group and individual work. Pupils are encouraged to role-play in order to consider opinions from different 'stakeholders', make decisions and solve a real-world problem. Using either the facilities provided by an ICT suite or a pin-board and curtain wire, pupils are involved in thinking, discussing and making presentations of the mathematically-based content. There are Curriculum opportunities to work with design and technology, geography, drama and English subject specialist lessons. An introduction - read this first for a more detailed overview. Pupil handouts - nine sets of pupil materials - some need printing on card, ideally in colour, and cutting out. Bypass software guide - an introduction to the icons used in the Bypass Software. Map - a map of the terrain in which the bypass is to be built. Pinboards guide - instructions for building a physical model using pinboards and curtain wire. Google Earth guide - guide to using Google Earth. Calculators and Converters - Excel Spreadsheets. The Bypass software requires a PC with MS Windows (Apple Mac users can still access the other material). An alternative approach using pin boards can be used without PCs. Microsoft Excel or an alternative (such as OpenOffice) is required in order to use the calculators and converters spreadsheet. OpenOffice is available from http://www.openoffice.org.